If you have ever read The Lord of The Rings or watched the movies, one of the main themes that drives the plot is fellowship. You are introduced to characters like Frodo Baggins, Gandalf, and Sam as well as the silly and inseparable duo that enjoy second breakfasts Merry and Pippin. The relationships each had with each other were deep before the great journey and it grew more intimate while on it. Struggles and battles, victories and loss all shaped the fellowship they had with each other. At the end you got a glimpse of how the bonds that they made were indivisible. This is the stuff of communion. And it doesn’t just happen in fantasy. The fellowship of close friends in a common purpose embodies one of the most precious privileges that we cherish and long for in this life. Whether in a strong Christian marriage or with that friend who sticks “closer than a brother” (Prov. 18:24), or, ultimately, in our union and communion with God. Read the words of Owen. “Now, communion is the mutual communication of such good things as wherein the persons holding that communion are delighted, bottomed upon some union between them. Our communion then, with God consists in his communication of himself to us, with our return unto him of that which he requires and accepts, flowing from that union which in Jesus Christ we have with him.” So without Christ and ultimately because of sin, communion with God is impossible. As Owen puts it, “By nature, since the entrance of sin, no man hath any communion with God. He is light, we are darkness; and what communion hath light with darkness?” Communion can only be a reality because of the Triune God being sovereign has sought to reconcile His enemies to Himself. By sending His Son, “Christ redeemed us from the curse of the law by becoming a curse for us.” The wrath we deserve fell upon Him and He stood in our place as our substitute. “Since, therefore, we have now been justified by his blood, much more shall we be saved by him from the wrath of God. For if while we were enemies we were reconciled to God by the death of his Son, much more, now that we are reconciled, shall we be saved by his life. More than that, we also rejoice in God through our Lord Jesus Christ, through whom we have now received reconciliation” (Romans 5:9-11). “In this is love, not that we have loved God but that he loved us and sent his Son to be the propitiation for our sins” (1 John 4:10). This communion is possible because each of the persons of the Trinity plays a unique role in the salvation of the elect (1 John 5:7). The Father elects to save His people in Christ (Eph. 1:4). The Son is appointed and willingly offers Himself as the Savior and Mediator (Luke 22:29; Heb. 10:5–7). The Holy Spirit furnishes Christ with the gifts necessary to accomplish His saving work (Luke 1:35; 3:21–22; 4:18), and also applies the benefits of Christ’s work to those whom the Father gives to the Son (John 6:38–39; 17:4). Thus, in a delightful harmony of mutual love and purpose, Father, Son, and Holy Spirit have eternally covenanted to redeem the elect community. Our justification, adoption, sanctification, and glorification are ‘Triunely’ planned, purchased, and applied. Our access to God is through Christ, by the Spirit, and to the Father (Eph. 2:18). The gifts of the Spirit are won by Christ and offered to the Father (1 Cor. 12:4-6). Our worship is through the mediation of Christ, by the Spirit, and presented to the Father. Our prayers are in the name of Christ, by the Spirit, and addressed to the Father. All that we have from God and enjoy with him is Triune. It is no secret that I am a Tolkien nut. Therefore I’ve love diving deep into the Middle Earth brought to us by Peter Jackson two epic trilogies: The Lord of the Rings and The Hobbit. Also, for the past two years I have listened to every episode of the Tolkien Professor’s podcast called “Riddles in the Dark” where a few other and more informed Tolkienists discussed what this last movie was going to be like. The time has finally arrived. No I did not go see the movie last night at midnight like some of you did but today, around 3, I will go see The Battle of the Five Armies. David Mathis, over at Desiring God has written a wonderful piece that cannot be improved upon remembering why so many of us love the world Tolkien created. Read it below. This is it for the Bagginses. At least for now, on the big screen. The Battle of the Five Armies, opening this week, is the sixth and final film in Peter Jackson’s pair of Tolkien trilogies. 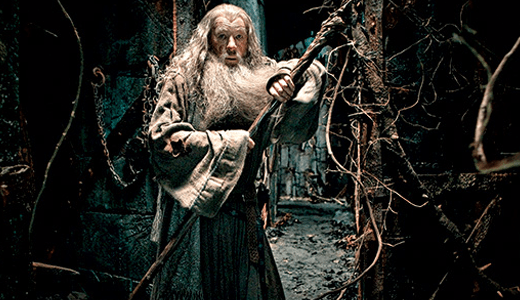 First, in 2001–2003, Lord of the Rings was nearly 1400 pages distilled into about ten hours on film. 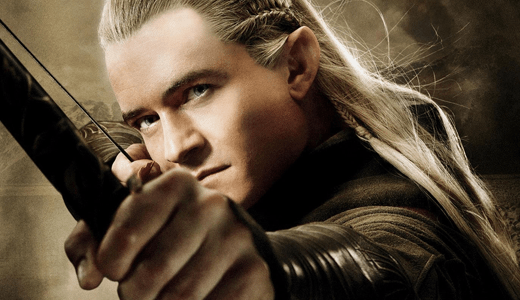 Now Battle of Five Armies completes The Hobbit movie trilogy, which expands Tolkien’s single 300-page book into almost nine hours of motion pictures. You may be able to read The Hobbit in a little over five hours, but it will take you almost twice that long to watch Jackson’s rendition. Not to add another voice with the naysayers. I’m delighted for the expansion, and Jackson’s efforts to weave white orcs and other wizards into The Hobbit, in a way that Tolkien didn’t, make the connections even deeper with the sequel. The Tolkien ultra-enthusiasts, including his son Christopher, have registered their frustrations — and likely would have done so with any theatrical version of the story. Their critiques can be pretty picky, and some have the smell of a musty hobbit hole. Say what you may about Jackson, he has done Tolkien and us a great service. Whatever disappointments we may have with the details, he has introduced millions of new readers, and a whole new generation, to Middle-earth. Countless of us, without Jackson’s midwifery, never would have buried ourselves in the pages of The Hobbit and its trilogy-sequel. One of the great effects, both of Tolkien’s stories and Jackson’s retellings, is the expansion of the human soul. We have such a proclivity to settle into such small things over time. We were made for more than vicarious living through social media and ESPN. There is real adventure to be had in God’s fantastic world, real evil to fight, real moral complexities to navigate, real sorrows to bear, real redemption to celebrate. Tolkien created Middle-earth not as an escape from the real world, but as a retreat to see our reality all the clearer and come back more wide awake to our world. You’ve been sitting quietly for far too long. Tell me, when did doilies and your mother’s dishes become so important to you? I remember a young hobbit who was always running off in search of Elves, in the woods. He’d stay out late, come home, after dark, trailing mud and twigs and fireflies. A young hobbit who would’ve liked nothing better than to find out what was beyond the borders of the Shire. The world is not in your books and maps. It’s out there. Tolkien’s stories summon us, like the wizard’s rebuke, not to settle for our little comforts and play spaces and semblances of control, but to dream for more, to lose ourselves in some great global pursuit, to vanquish the foe, to win the peoples. But on our own we will be swallowed up by such a quest. Evil in the world is real and powerful, as Tolkien so starkly portrays. And so throughout The Hobbit, says Devin Brown, Tolkien is teaching us a lesson about “luck,” mentioning the term over and over again. 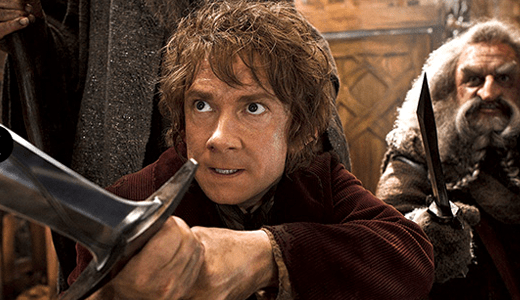 “Luck” is said to rescue Bilbo repeatedly in just the nick of time. But on the book’s final page, Tolkien reveals what he’s been setting us up for all along. It’s Bilbo and Gandalf again. In the end, the hobbit’s “luck” points beyond mere coincidence in surviving, and triumphing in such a great adventure, to an invisible Hand at work in the entirety of the story. the sudden joyous “turn” . . . a sudden and miraculous grace: never to be counted on to recur. It does not deny the existence of . . . sorrow and failure: the possibility of these is necessary to the joy of deliverance: it denies (in the face of much evidence, if you will) universal final defeat and in so far is evangelium [the gospel], giving a fleeting glimpse of Joy, Joy beyond the walls of the world. In Lord of the Rings, the creature Gollum bites the ring from Frodo’s finger just as he has reached the fires of Mount Doom and turned away unable to part with his precious. The catastrophe of Gollum taking the ring and his finger turns for good when Gollum slips and falls into the fires below, accomplishing Frodo’s great mission. 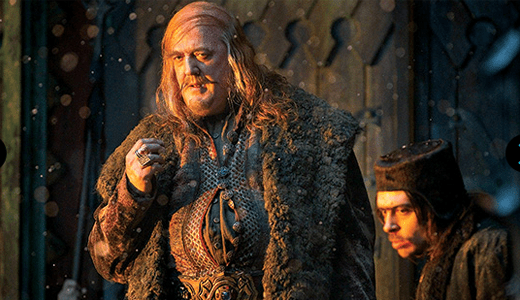 Watch for “the sudden joyous ‘turn’” in Battle of Five Armies. Jackson has borrowed it from Tolkien. But Tolkien would be the first to say that he borrowed it as well. The Birth of Christ is the eucatastrophe of Man’s history. The Resurrection is the eucatastrophe of the story of the Incarnation. This story begins and ends in joy. It has pre-eminently the “inner consistency of reality.” There is no tale ever told that men would rather find was true, and none which so many skeptical men have accepted as true on its own merits. looks forward (or backward: the direction in this regard is unimportant) to the Great Eucatastrophe. The Christian Joy, the Gloria, is of the same kind; but it is preeminently (infinitely, if our capacity were not finite) high and joyous. But this story is supreme; and it is true. Art has been verified. God is the Lord, of angels, and of men — and of elves. Legend and History have met and fused. J.R.R. 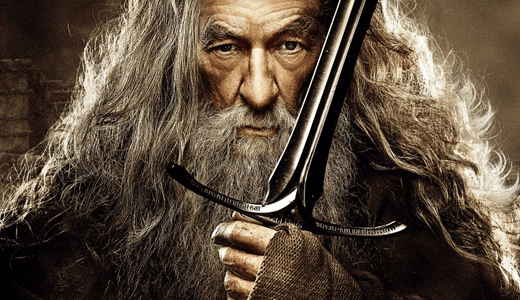 Tolkien, covert Christian Hedonist we might say, wrote The Hobbit for your joy — that you would experience a joy connected to the Great Joy itself. Tolkien would say that Jackson has strung us along with some foretastes of the joy at the end of the first two films, but now we come to the true “happy ending” and the moment when this tale draws closest to the Happy Ending of all history. 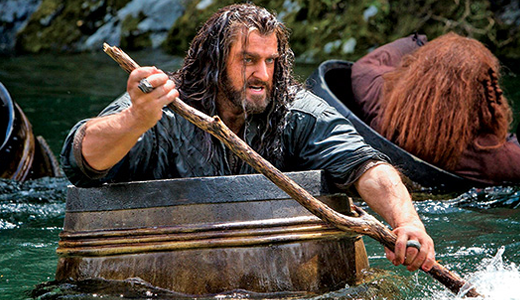 This final hobbit movie won’t be it for Tolkien. His stories are as popular as they’ve been, and surely he’ll have another day on the big screen. Hollywood keeps redoing the Batman, after all; the Bagginses will come again soon. 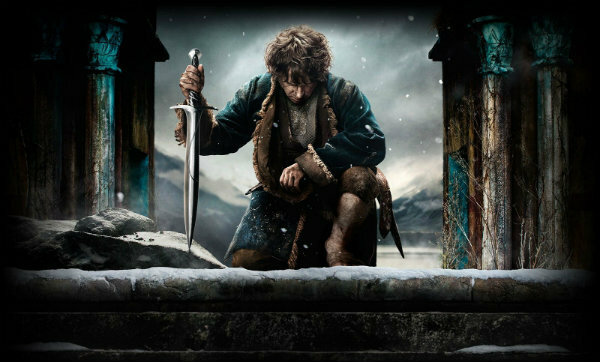 This may be Bilbo’s last goodbye under Jackson, but for Christians, here we find just a gleam, just a faint echo of the Joy that is, and is coming, and will shine and sound for all eternity, and satisfy our souls in that True Story for which we were made. This airline knows why people visit New Zealand. I have a confession to make. Well not really a confession because I want to tell you something I’m very fond of actually. I am a huge Tolkien fan. Meaning that I’ve read the works of J.R.R. Tolkien many times, both the lesser-known and well-known, and love breathing the air of Middle Earth deeply. There are many reasons for this, and when I count all the benefits of spending time in Middle Earth via reading Tolkien’s work the number one reason I enjoy it so much is it’s impact on my view of normal mundane life. Why is this so? It is my opinion and the opinion of many other Tolkien fans that reading his fantasy novels (like The Hobbit and The Lord of the Rings) enriches our experience in this life. It is after reading of glorious sunsets, battles, epic journeys, death defying feats of courage, and calm serene elvish and enchanted lands in Middle Earth that my activity in this life becomes more rich. I think what I mean is this: after reading Tolkien I notice what I ignore to a deeper extent. In fact it is true to say that my reading “there” makes my joy “here” deeper rather than leaving me with a desire to depart this world and “escape” to Middle Earth. This poem, as the other poems in Tolkien’s works, are meant to teach great and glorious realities about life in this world. This poem is my favorite because of what it means on the surface and what it points to in reality. All that is gold does not glitter – not everything that shines in this world is worth our devotion. In fact, many things that shine are worth ignoring and paying no attention to. We all know this to be true. If you do not know what this means, think about it. Does not gold shine along with copper? Gold is desirable, copper is not. Gold will make you rich, copper will not. Spiritually speaking, gold is holy copper is sin. Both shine, both lure us in. Only one will benefit us. Beware. Not all those who wander are lost – many people view those who stray/wander as lost and hopeless. But how often do we see those very wandering ones rise up in due time to greatness? In The Hobbit and the Lord of the Rings we see it over and over. In the Bible we see the same. Do not despise those who wander or those who have strayed. They will teach you much in days to come. The old that is strong does not wither, deep roots are not reached by the frost – this is clear is it not? Why is it that the strong old ones do not wither? Because the roots are deep and are not touched by what takes place above. Gandalf is not speaking of trees here, but of us. Certain people who are so strong in character and courage that no matter what is taking place on the “surface of things” (be it war or peace) they are calm and at peace within. What kind of person is this? Directly Gandalf is referring to Aragorn, whom he will reference more clearly soon. Indirectly Tolkien via Gandalf is referring to those who are strong in the Lord. From the ashes a fire shall be woken, a light from the shadows shall spring – Here Gandalf becomes very symbolic in what he is talking about. A thing of old is about to re-enter the world in power. What happens when something dies? It falls into ash and shadow. Gandalf is saying what has fallen will wake, it will rise. What is he speaking of? Look at the last phrase. Renewed shall be blade that was broken, the crownless again shall be king – Aragorn is in view here. He once lived among his brothers in the North, the courageous men of Numenor, warriors, bold and strong. But they were put to rest by the Witch King of Angmar (who is now the leader of the Nazgul Ring Wraiths). Though he was fallen, though he lay in the dust, though their blade was broken (reference to the shards the Narsul – the sword that cut off the ring from Sauron’s hand), it shall be re-made. The one who comes wielding that sword, shall be king. Who wields it now re-forged? Aragorn, the coming King, typifying Christ the whole time he comes into his throne. As you can see, such rich imagery, such rich language, describing even richer realities. Tolkien’s works are full of this type of richness. But how would you ever know unless you read them? Go for it. Drink deeply. Breath in the air of Middle Earth and be refreshed. See Christ in all of it. More than seventy-five years after J.R.R. Tolkien wrote The Hobbit, the glory and majesty of Middle-earth continues to draw millions of readers, and more recently, moviegoers. 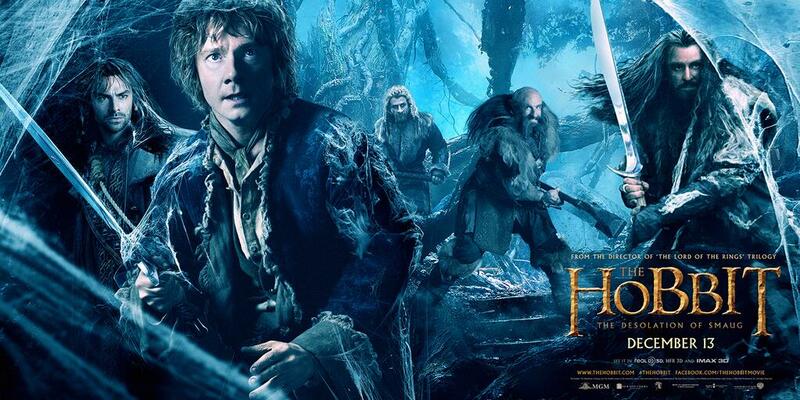 This week, theaters prepare for Friday’s opening of the acclaimed new movie The Hobbit: The Desolation of Smaug. Partly, Tolkien’s enduring popularity can be explained by the way he artfully touches the greatest themes of our collective experience of this world. Tolkien draws on themes of glory and majesty and kingship — intangible and abstract realities not easy to tap in art — and deeply embeds those themes into Middle-earth. No foot treads casually through realms unruled. This is a very important theme in Tolkien. The elves are often described as both old and young, both joyful and sad.
. . . in the wizard’s face he saw at first only lines of care and sorrow; though as he looked more intently he perceived that under all there was a great joy: a fountain of mirth enough to set a kingdom laughing, were it to gush forth. And I agree—it is very helpful in describing the demeanor of Christians, who will feel the fallenness of the world most keenly because they know what God created the world to be, and who know that nothing within history will ever bring about any fundamental repair of things, and yet Christians also have an unquenchable, infallible assurance that in the end, everything will be joy and glory. So how else can we act, but “sad, but not unhappy,” “afflicted, but not crushed”—weeping, but rejoicing.